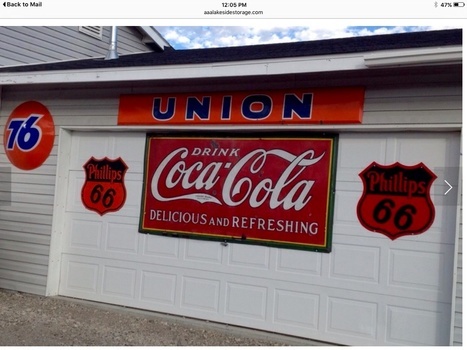 In Coca-Cola > Coke Signs > Show & Tell and Signs > Gas, Oil, and Service Signs > Show & Tell. We got this cute Coke sign from a Picker friend in Tenn. while returning from a trip to NC a couple of years ago. Called the guy on the phone and he was on the road so we had to meet him at 10pm at night in a convenience store parking lot to make our deal. We meet the nicest people in this hobby and this guy was one of the great new friends we have made. I still love the hunt! The "Find" is even better! I'm glad the transaction was not for a small thing - 10pm deals in parking lots could be a bit sus! Exactly!!! We were driving across Country in places we had never been with a P-51 mustang airplane dismantled on our trailer and meeting up in Tenn in the late of night after a rainstorm to meet at a gas station parking lot as we proceeded on our trip!!! Sounds very sketchy!!! Actually it was not so sketchy and the Picker who we had been dealing with for several months previous to finally arriving in Tenn, was willing to go to his storage unit and get the sign out and bring it to a place near the Interstate to make it convenient for us. Very nice guy and decent price for a pretty nice sign. We love the sign and he is a great person! Thx for the love it. Interesting that we have yet to have even one reader of CW write to offer us a sign of any kind to add to our free museum? Not sure what that tells me? Thx for the love it.